Carrot juice benefits-CARROT JUICE for cancer-MIRACLE health benefits. Carrot juice is known as a miracle juice. It is rich in cavitamin A and removes bacterial infection from the kidneys and good for refractive errors in eyes, strong bones and healthy teeth. It is also rich in vitamin E. Which has proceed as antisterlity and anti cancer factor. It is also a powerful blood dexyfaying and to stop intestinal putryfaction. Carrot juice is one of the most health rejuvenating juice for invalids. Allmost in all Nature Cure Centres in India, patients are given carrot juice daily during their health rejuvenation. Carrot juice is rich in vitamin A, this vitamin A in the natural form gets easily assimilated in the body. Apart from Vitamin A, it also contain Vitamins B, C, D, E, G and K. Carrot juice is misunderstood to be heavy to digest and cough producing. In fact it acts as an appetizer and stimulates the secretion of digestive juices. It also strengthens the teeth. Carrot juice helps nursing mothers to enrich their milk. The chances of developing puerperal sepsis is minimized by the regular intake of carrot juice during pregnancy. If it is taken during the last three months of pregnancy, it tends to reduce the hazard of infection after childbirth. It also meets the demands of calcium during pregnancy. One pound of carrot juice is equal to 20 pounds of calcium tablets as far as the active calcium is concerned. Carrot juice removes the bacterial infection from the kidneys. It also builds up the nervous system carrot juice is rich in minerals like sodium, potassium, calcium, magnesium, iron etc. Many experiments were done in Germany in 1840 to prove these properties of carrots by experimenting on rabbits. He found out that the carrot juice removes the offensive odour from the faecal matter of the animals by reducing the number of harmful bacteria there in.Some of the candidates aspiring to join the Air Force in U.S. A. were rejected by for having refractive errors in eyes. They were given carrot juice for two weeks which rectified their eye sight defects. Thus they became eligible for the admission in the Air Force. 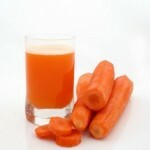 Some European Naturopaths have started using carrot juice successfully for treating ulcers and cancers. Some think that carrots are contraindicated in diarrhoea and liver disorders. But carrot juice can be successfully used in such conditions instead of carrots. One American lady met with an accident which damaged her nervous system. She also developed jaundice and arthritis within a few days. She was admitted to a sanitorium. The investigations showed that she was also having renal stones. Her weight reduced to 65 pounds from 135 pounds during this illness. Three physicians stamped her to be a patient of leukemia (blood cancer) after thorough examination. The treatment began. But she did not respond to it. She could not tolerate the medicines and used to vomit them out. She developed intolerance to food which emaciated her still further. She got fed up with this treatment and stopped it. She then went to another doctor in Europe. The doctor started carrot juice therapy. The initial dose was only teaspoonful of carrot juice thrice a day. She was given no other food and all the medicines were also stopped. To begin with the live juice caused diarrhoea but gradually she tolerated it. Her appetite increased. Gradually she was able to consume a more quantity and thus she kept absolutely on the carrot juice for 18 months. During this period all her chronic and incurable ailments were relieved. After one and a half years with raw juice, she gradually added other food substances to her diet. Her weight came back to 135 pounds and she was full of vigour and vitality. She was able to work hard for 12 to 16 hours per day and that too standing all the while with perfect health. Now also she takes only carrot juice throughout the day and her regular meals in the evening. Carrot juice is known as a miracle juice. This live food cures many chronic diseases. It also helps to maintain the health of every person. Hane Anderson, a well-known dietitian has succeeded in curing one 72-years lady of her stomach cancer with 200 grams of the carrot juice, which contains more than 50000 units of Vitamin A. Carrot juice is a must for good eye sight, strong bones and healthy teeth. It also proves useful for mothers to improve the quality of breast milk. Of the many vitamins in the carrot juice the most important is Vitamin A and next is Vitamin E. It is present in three chemical forms – alpha, beta and gamma to co-pherrol which are collectively known as Vitamin E. complex. Vitamin E has been proved as an anti-sterility factor in animals. The endocrine glands, especially, the adrenals and the gonads require food elements found in raw carrot juice and sterility is sometimes overcome by its use. Laboratory experiment have shown that cancer cells cannot thrive in the blood full of vitamin E. Animals fed on vitamin diet enriched with this vitamin developed resistance to cancer. All the medical properties of vitamin E have not yet been fully investigated. However, it has been established that carrot juice helps in developing immunity and strengthens the body cells due to the presence of vitamin E in it. Carrot juice constitutes a powerful cleansing food and is one of the most effective means of changing the intestinal flora from a putrefactive to a non-putrefactive type. In many nature cure centres spinach juice is added to carrot juice. Addition of 50 grams of spinach juice to 250 grams of carrot juice makes a tasty cocktail. A little lemon juice also can be added to it, but no salt should be put in the mixture. This drink is very effective for the treatment of constipation. Spinach juice cleanses the bowels. The effect cannot be expected soon after taking spinach juice with the carrot juice. But within a period of about two months, the bowels start emptying regularly. Spinach juice also helps in strengthening the teeth and gums. Many urban dwellers have decayed teeth due to which they suffer from foul smelling breath. They can get rid of the foul breath by taking spinach juice alone or mixed with carrot juice. Spinach can be consumed in the form of salad. This leafy vegetable does not require cooking. Many people wrongly believe that high levels of oxalic acid present in spinach can cause renal stones. The real cause of the stone formation is the metabolic wastes of food such as meat, fish, eggs, sugars and white bread. These substances undergo many processes in the body before the end products for their metabolism are excreted by the kidneys. These multiple processes and changes lead to the formation of stones. This is not the case with spinach and tomatoes. These foods are usually blamed for the formation of renal stones, due to their oxalic acid content. Carrot juice is perhaps one of the finest blood purifiers available to man. Excess consumption of carrot juice may cause a yellowing of the skin, particularly on palms of the hands and the soles of feet. This pigmentation has no connection with jaundice, but is due to carotene from which vitamin A is formed within the body. This yellowing is a harmless condition, which soon disappears when carrot juice is given up or its intake restricted in quantity. Mrs. Mary C. Hogle has described the rejuvenating effects of carrot juice in her book. “Foods That Alkalinize and Heal.” The description is based on self experience. Mrs. Hogle was very ill in the year 1900. Her digestive system was not functioning properly. Her intestines had lost their tone. Their inner lining had become very loose and eroded. She used to bleed from the ulcers very often. As the disease progressed, she lost all hope of life. Meanwhile, she came across a booklet “The Health Question Box” written by Dr. John Harvey. The author had described in it the medicinal effects of carrot juice. Mrs. Hogle took carrot juice. Within a short period, she got rid of the abdominal colic and the intestinal bleeding. Her intestinal mucous membrane was completely healed and regenerated. She regained her health within a few months. In many nature cure centers carrot juice is compulsorily given to every patient. We have experienced its beneficial effects for many years. Farmers from many European countries like France and Germany use carrot juice for curing gastric and digestive problems. Carrot juice is very effective in curing the diseases caused by increased acidity in the tissue fluids. It detoxifies the blood and cures many ailments caused by impure blood. It can be used successfully in contagious diseases, anaemia, diabetes, piles and debility. It is anti-infective and protects eyes, throat, sinuses, tonsils and entire respiratory tract. It also decreases hyperacidity and removes foul breath caused by it. Bleeding gums and ulcers in mouth (stomatitis) are also cured by carrot juice. The minerals present in the carrot juice are very easily assimilated in blood. Hence it helps in re-establishing the alkalinity of blood. It is an excellent blood cleanser and helps in alkalinizing. Normally urine is slightly acidic. Increased acidity indicates ill health. Carrot juice helps in maintaining the PH of the urine. Carrot contain an antiseptic principle which develops immunity inside the body cells. Mucin from the carrots acts as a lubricant for the internal lining membranes of the organs. The minerals from carrots (mainly calcium) get easily absorbed in the blood stream. Their assimilation is easier than the minerals from other vegetables. The amount of carrots needed for rebuilding the debilitated body forms a big bulk, the consumption of which is not practicable. The same can be easily done by consuming carrot juice. Carrot juice added to milk for babies helps to build good teeth and bones and hastens their growth and development. Dr. H.E. Kirschner quotes many instances of carrot juice diet curing cancer in his book “Live Food Juices.” He related therein a story of leukaemia arrested with raw carrot juice. The eldest daughter of the concerned family died soon after birth due to leukaemia (blood cancer). The girl was born in 1951. At birth she was apparently very healthy and was referred to as a “prize baby”. But she gradually became pale. The parents became alarmed and consulted their physicians. Her blood count revealed that the baby girl was suffering from leukaemia. She was shifted to a hospital. She was given twenty five blood transfusions within five and a half days, but all the efforts to save her life were fruitless and the little girl died at the age of three months. Second child, a boy was born in 1953. On examination of his blood revealed the terrifying fact that this boy also was born with leukaemia! The baby’s doctor became acquainted with the remarkable experience of Mrs. Catherine Ferraro, who had recovered from splenic leukaemia by taking large quantities of carrot juice daily. He determined to save the child’s life by the same means. He gave him carrot juice for the first three months. After three months, however, fruits and vegetables were added to his diet. At the end of one year the blood count was normal. There was no evidence of leukaemia. The carrot juice had evidently performed a miracle in restoring the child’s diseased blood stream to a normal healthy condition. The boy still continues to take his daily ration of carrot juice. The third child, a baby girl, was born in 1954. Blood tests made at the time of birth showed no evidence of leukaemia. This was due to the fact that the mother drank carrot juice regularly throughout her pregnancy. The parents did not want to take any chance and the third child was also given an absolute carrot juice diet for three months after birth. She still continues to take two glasses of carrot juice per day. Both of them have good health and are full of vitality and vigour. Though carrot juice is a precious food, restoring health and giving vitality, it cannot be the only remedy for all the types of cancers at all stages. The treatment and the diet should vary according to the needs of individual patients. Carrot juice cannot be said to be useful in each and every disease. It should be avoided in diseases like cold, influenza, pneumonia and other febrile conditions. The body tries to get rid of accumulated toxins in it during the period of illness. Carrot juice or any other diet hinders this process of internal cleansing. But the carrot juice can be very effectively used in ailments like chronic tonsillitis, intestinal colic, colitis, appendicitis, tuberculosis, malnutrition, anaemia, renal stones, hyperacidity, peptic ulcer, dyspepsia and impurity of blood. A research scholar from an American institute centre for science for public interest states that the beta-carotene present in carrot and some other vegetables and fruits possesses the property of preventing and even curing cancer. This is possible only by using these vegetables and fruits in raw state. The natural chemical beta-carotene gets converted into vitamin A in the body. One who consumes carrot juice early in the morning on an empty stomach does not need to take any synthetic vitamin A. It has been found that the Nowergians hardly use any vegetables due to which the percentage of lung cancer is very high among them.